When is the last time that you saw someone order a martini on the rocks? I did last weekend. Makes sense. The drink stays much colder. Martinis didn’t used to be as large as they are today. They were quicker to consume. But with our current incarnation downing eight ounces of hard liquor mixed with a splash of wine isn’t the easiest thing to do. Unless it’s very, very cold. And sipping one of these monsters always leaves the drink too warm to properly enjoy by the time you get to the end of it. I can’t give up the martini “up.” The iconic glass is a thing of beauty to me. The perfection of the round olive resting in the sharp angle at the bottom of the glass is a lesson in good design. It is a divine proprotion, sort of a “silver section” if you will. Which is why it makes perfect sense that The Architect, himself no stranger to the beauty and challenges of creating good design, would be the one to solve the problem of keeping a martini “up” cold. The simple solution is always the most elegant and The Architect’s is a very easy one. Off to see Mr. Eddie Ross this evening. Hope I remember my camera. 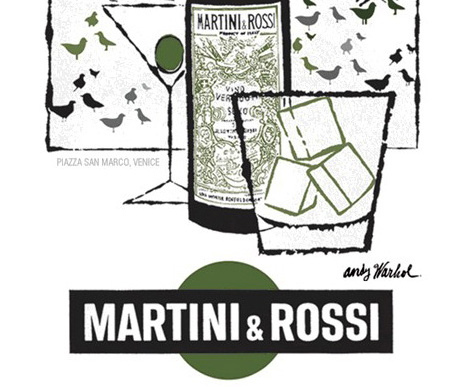 This entry was posted in Entertaining and tagged Eddie Ross, Martini & Rossi Vermouth, martinis, The Architect, Warhol. Bookmark the permalink. Great thoughts on the Classic Martini! It seems everyone in my blog world is meeting Eddie And Jaithan! Okay I know they will be back to Kansas City soon…..
What a great idea! I used to drink martinis but gave them up in favour of vodka and club soda on the rocks simply because I like a cold cocktail. I will try freezing the olives for our next party! Love the idea of freezing the olives. I bet you enjoy Eddie and Jaithan – they are terrific. We have a collection of martini glasses that I love, and over the years, the glasses look like swimming pools. On the rocks I use frozen lime juice. As it melts my martini becomes a gimlet! Is it OK to tell you how I make my martini? Delete this if you like. I keep my potato vodka in the freezer – makes for an especially cold martini. Pour from the bottle into the martini glass. Add at least 2 very nice large olives with pimento (gourmet of any brand works well) and possibly a 3rd olive. Make sure some of the marinade from the olives makes it into the cocktail. “downing eight ounces of hard liquor mixed with a splash of wine isn’t the easiest thing to do” – What in the world could possibly be easier? I guess it’s easier if you skip the vermouth (and in my case the maraschino juice), and the glass for that matter, but people will talk. The problem with freezing olives in the is that it makes them essentially flavorless. On the plus side, it doesn’t water down your drink when it thaws, which is why I use frozen grapes to keep chilled white wine…chilly. I also strongly support Paul’s policy (Paulicy?) of keeping at least your clear liqours in the freezer, for the same reason. This makes Paul more manly than James Bond, as the latter likes his watered down (shaking gets it colder, but also melts much more ice.) Incidentally, the Bond signature martini is (per the original Bond novel) three measures of Gordon’s, one of grain (as opposed to potato) vodka, and half a measure of Kina Lillet, shaken with a lemon twist. I haven’t seen Kina Lillet for sale, but I’m told Lillet Blanc is the modern equivalent. See here, but without endorsement: this is not the bottle I have at home. Worth noting that, despite some labels, Lillet Blanc is not in fact a vermouth. Love Doug’s idea of frozen lime juice–fresh limes, squeezed and frozen? My in-laws are a Gordon’s gin family–all of them store their gin in the freezer and always have. I don’t drink martinis, but a Tanqueray and tonic on the rocks with a generous squeeze of fresh lime suits me just fine. The 750 mL bottle with the pretty red wax (?) label is a beautiful bottle for the butler tray table. Mrs. E.’s grandfather premixed martinis in the bottle and kept the whole in the freezer. I can’t spare the room at the moment. I used to keep the vodka iced. As a bachelor. Vermouth, by the way, is a wine. Refrigerate after opening. Cap’t I like a good Vesper (the Bond martini.) The Lillet Blanc is interesting. And a little water isn’t such a bad idea in a cocktail, every once in a while, it opens them up. As I age, I take more vermouth in a martini, too. Still prefer my martinis stirred. The best and coldest martini I was ever served was a couple of years ago in a restaurant on the upper west side of Manhattan. Sorry, can’t recall the name, but I clearly remember the method. The martini was served in the more suitably smallish glass of the times that was poured right at the table from what appeared to be a miniature martini shaker. While I was downing the first glass, the remnants were holding their chill in the shaker. And a resounding ‘yes’ to vodka in the freezer. EA, the same technique as used at Bemelmen’s Bar! I have one of those little shakers (hotel silver) that is a favourite.